This bot gets weather information from weather stations closest to your location. Since there are usually many weather stations located in each city, the weather information will be more accurate than generic weather reports. On our mobile device, specify a location by using your current GPS location, or by selecting a location on a worldwide map. That location is used to find the closest station and weather data. Once you select a location, it is saved. If you want to get another weather report, you can select another location, or just use the /current command to get the current weather report for your last selected location. If you don’t travel, using the /current command is the quickest way to get a weather report since it can be invoked with one keystroke. If you want to get a forecast instead of the current weather, use the /forecast command. You will be presented with a timeframe options frome 0 to 72 hours. Selecting a timeframe will show the weather forecast for that interval. TapIn gets weather data fromWeather Underground. 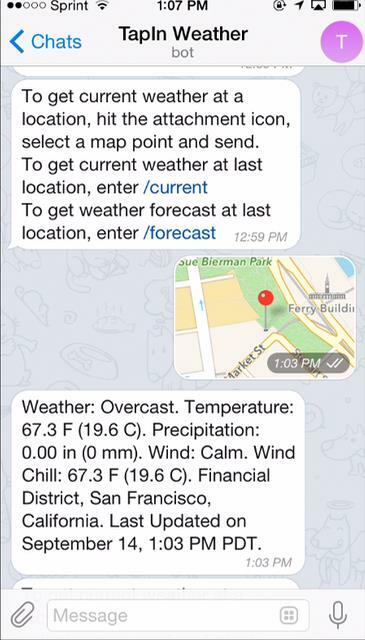 To chat directly with TapIn Weather do the following.